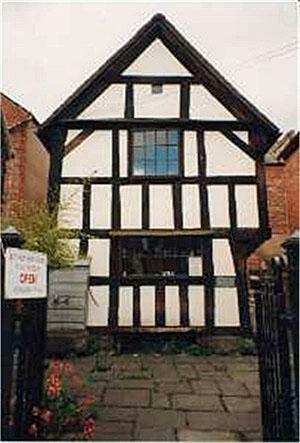 The Butchers Row House Museum is a quaint timber framed medieval building sitting comfortably at the top of Church Street in Ledbury. It looks as if it has been there for centuries when, In fact, this little Victorian cottage has been around the block! Once it sat snug in the middle of Ledbury’s High Street as a part of a row of 15 burgage houses and shops, known as Butchers Row (the earliest reference goes back to 1468). As the name indicates, this is where animals were slaughtered; the gutters ran crimson and there was a lingering smell of death in the air. In 1830 the buildings of Butchers Row were torn down to make way for new development. Fortunately the little building was kept intact; the frame was dismantled and re-erected years later (in 1979) at the top of the picturesque Church Lane, where it still stands today. The museum is a real delight to both historians and the regular Joe. It is filled with fascinating relics and trinkets from a time gone by, exhibiting life in Ledbury during the Victorian period. 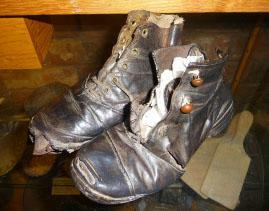 One of the many interesting artifacts on display is a small pair of mismatched Victorian shoes that were discovered at the council offices during the 1988 refurbishment. There are two theories here, either the shoes were handed in for a new pair under the Poor Law system, or they were walled into the house to keep the spirit of a child on the premises. This custom has been practised since the Middle Ages. It is believed that the shoe can still hold the essence of its owner, as it’s the only garment that moulds to the owner’s shape and still holds their spirit after death. The shoe would be placed in the wall (especially over a front door or window) to discourage bad spirits and protect the home. There is so much to take in, so much to see and so much to learn. The museum houses reproduction helmets and breastplates as worn in the Battle of Ledbury (1645), Victorian costumes and various Victorian folk curiosities, including a collection of musical instruments, from a hurdy-gurdy to a Tibetan pipe made from a thigh bone. In 2010 the museum had more than 15,000 visitors. It has been awarded accredited status by the Museums Libraries and Archives Council. It was the first independent Museum in the West Midlands to receive this award.